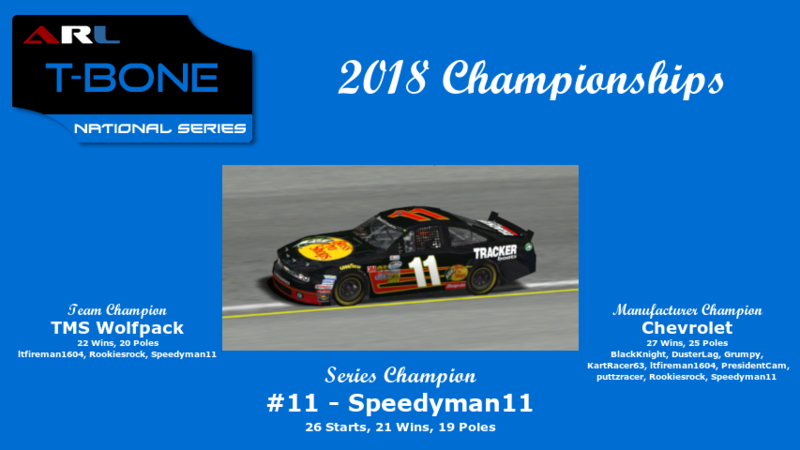 Speedyman11 has officially captured the 2018 ARL T-Bone National Series championship after race results were finalized Tuesday. This is Speedyman11's second consecutive National Series championship and fourteenth overall ARL Racing championship, Speedy is now tied with Donaldson for most championships in the league. Speedy captured an incredible 21 wins in his 26 starts. DusterLag, who finished second in the championship standings, also had the second most wins at 3. Speedy drove the #11 Chevrolet powered car for TMS Wolfpack. Speedy also picked up 19 poles during the season. Speedy, DusterLag, Grumpy and Bandit made it through the regular season and all three Playoff rounds to end the season as the championship 4. 2018 was Speedyman11's fourth season in the series and sixth active year racing in the ARL with his first start in 2013. TMS Wolfpack; with drivers ltfireman1604, Rookiesrock and Speedyman11; captured the 2018 Team Championship, their second in the T-Bone National Series. Chevrolet; with drivers BlackKnight, DusterLag, Grumpy, KartRacer63, ltfireman1604, PresidentCam, puttzracer, Rookiesrock and Speedyman11; captured 2018 Manufacturer Championship, the fifth time they have captured he T-Bone National Series title. Drivers ran a total of 28 races across 10 months during the 2018 season. 2018 gave us 6 different winners and 7 pole sitters with 16 participating drivers. 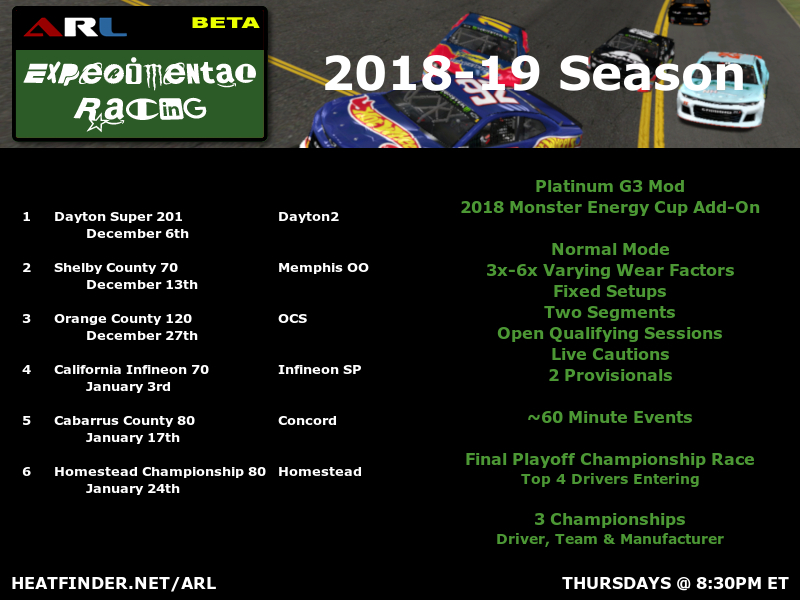 The 2018-19 ARL Experimental Racing Series, the inaugural Season 1, schedule as been officially released!